In nutshell, flow-based programming (FBP) is a paradigm where programs are built from components that have a set of defined input and output ports. These ports are then wired together to make a graph that defines the logic and the data flow. 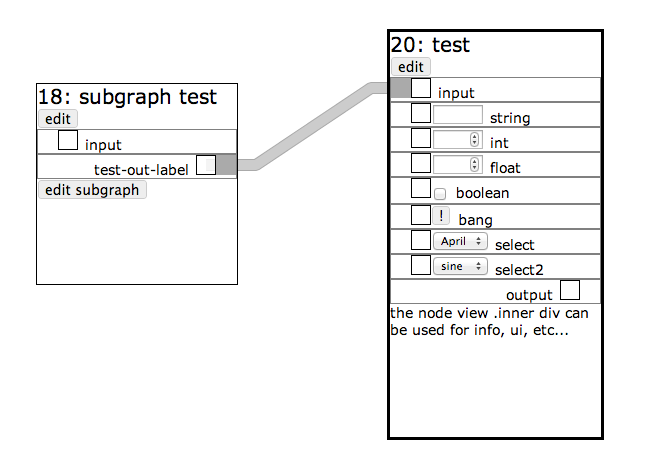 At the moment there are two user interfaces that can be used for defining NoFlo graphs visually. 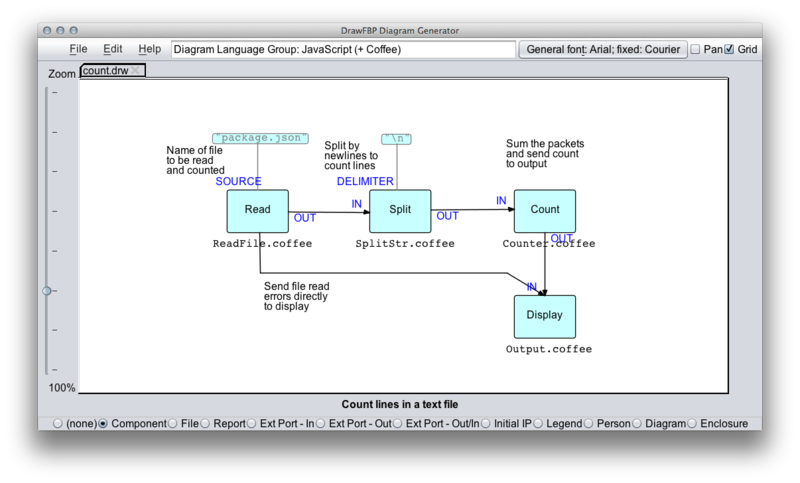 DrawFBP is a desktop application that can define flow-based program graphs for both NoFlo and the Java and C# flow runtimes. The noflo-ui interface benefits from being able to talk directly to NoFlo itself, and so getting all the metadata about components and their ports. The current iteration was built with the jsPlumb library, and works also on touchscreen devices. Imagine programming your NoFlo graphs on a tablet! 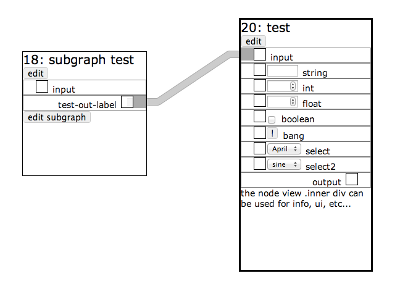 While in the real world you’d probably want to edit the graphs visually, at least the graphviz tool can be useful for autogenerating documentation for larger flow-based programs. 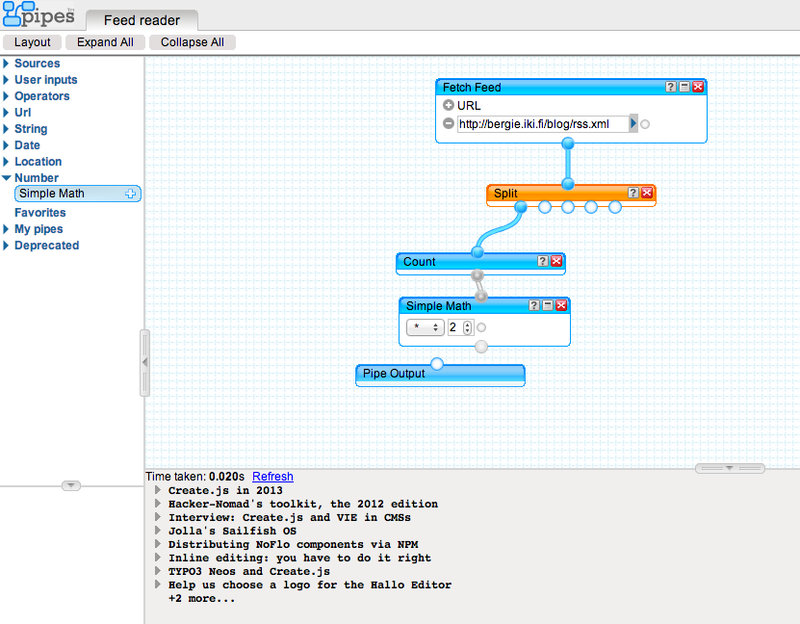 When the library matures a bit more, it is likely to be the basis for NoFlo’s graph editing interface. Flow-based programming tools can help a lot here, as the main logic of a program is anyway depicted as a visual graph. With NoFlo we can even connect the user interface to a already running piece of software, allowing users to see what is going on and to make changes while the application is runs. Think of the mimic boards in nuclear power plants where the operators can constantly see the status of every part of the process. We’re building something new and exciting with NoFlo here, and so the visual identity should also reflect that. No need to follow the drab look-and-feel of traditional IDEs! There is certainly something of flow-based programming right there. And this is why the current NoFlo UI has a distinct Tron-like look to it. If Apple made a finger-friendly version of this for the iPad, we would be pretty close to the UI NoFlo needs to have. A problem with most of the existing flow-based editors is that they go into too much detail, making bigger graphs hard to decipher. Of course, moving chunks of a graph to subgraphs and using those as components helps, but still a complex program can be a confusing tangle of crisscrossing lines. 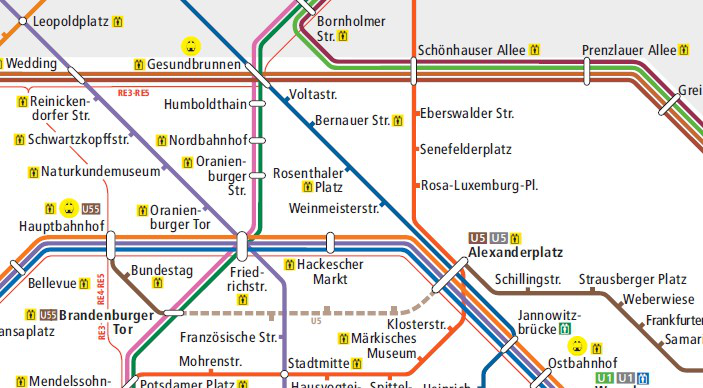 Luckily, there is an area of information design which has tackled this problem already: transit maps. The different tariff zones even map quite nicely to the idea of subgraphs in FBP. Don’t focus on the details too much. You have nodes, and connections between them. Why show the port names on this level? NoFlo 0.3.1 will make it possible to annotate connections in a flow with arbitrary “route names” that can then be assigned to colors for visualization purposes. 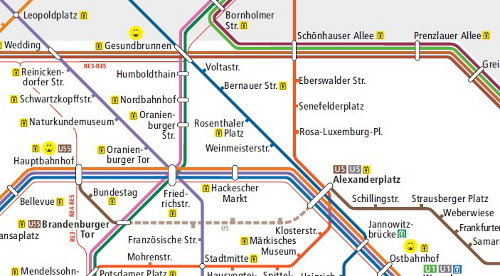 Quite some research and tools already exist for automatic generation of subway maps. 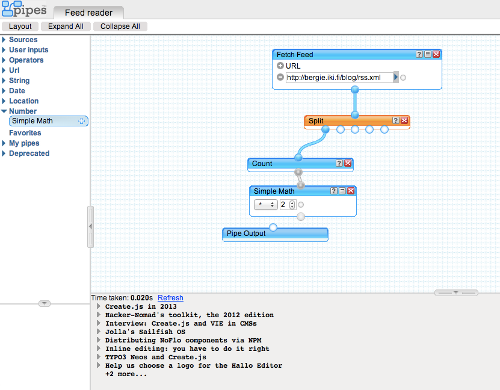 Maybe some of these could be repurposed to give the NoFlo UI a “bird’s eye view” to your flow-based programs? So, how to make this user interface happen? 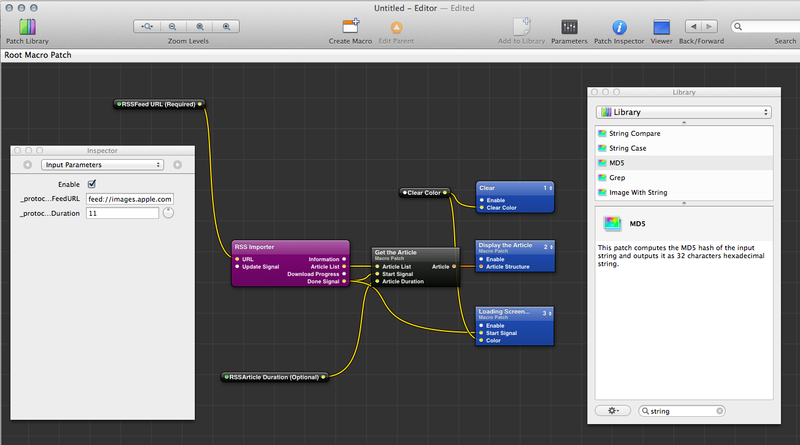 As mentioned, I’m building software with NoFlo on daily basis now, and so better tooling is certainly urgent. And not just for me, but for all the others interested in flow-based programming. In the recent project planning sessions I’ve allocated some time to this, and so I hope we can get somewhere with a more-or-less working user interface still during this winter. All of this will obviously take a lot of time, but we’ll have to see how far we get with the first iteration. Having an editor that people find more usable than writing graphs by hand should be the first goal. If you’re interested in this, please follow the noflo-ui and dataflow repositories. The Flow-based programming mailing list is also a great place to discuss your ideas. 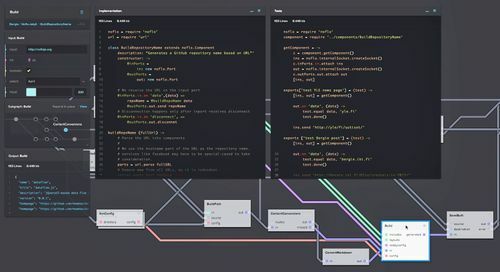 Update: this work eventually lead us to building Flowhub, a web-based IDE that works across all flow-based programming systems. Check it out!